Back to School: the dreaded words that accompany shortening days and an autumnal chill in the morning air. In my past life as a teacher I chose not to look at the ‘Back to School’ signs that always appeared far too soon in the shops. All teachers will tell you that, unless you divert yourself by escaping on holiday, the month of August can seem like one long Sunday night before the biggest Monday morning of them all, the September start of term. It is a truth universally acknowledged that the challenge of this hurdle doesn’t get any easier, no matter how many years you teach. But we carry on because, once we’ve got used to the externally imposed timetable and the routine, we always find pride and joy in our work again. There is a particularly special moment to seize here of sharpened pencils, glowing highlighter pens, crisp new exercise books waiting to be filled, syllabuses to be discovered, qualifications to be gained. Brains are not yet tired, and there is an eagerness to learn new things. And there is always a holiday to be longed for and savoured when it comes. Now that I’m retired, summer holidays are not quite what they used to be. I have no OU course on the go, no choir on Tuesdays, no Pilates on Wednesdays. We also don’t go on holiday in July and August, because that’s when everyone else does. So by mid-August my views on ‘Back to School’ are a little different from what they once were. It’s not quite the ‘Mum, I’m bored’ mentality of my teens, but it’s a wish for routine and structure imposed from outside; I don’t seem to be very good at imposing my own. Must Do Better. 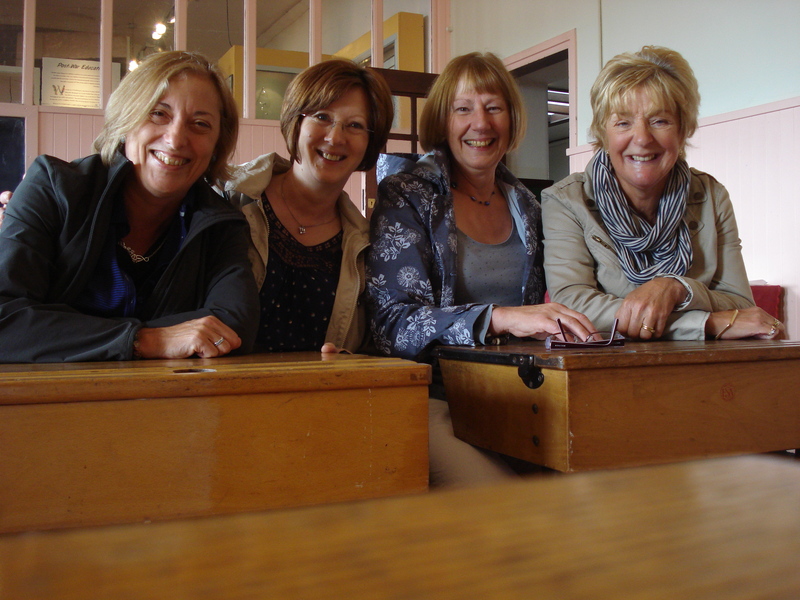 However, one of the pleasures of this summer has been meeting up with old friends from various educational institutions. On the train to Glasgow last week to meet three school friends I realised it was fifty years since we’d started secondary school at Montrose Academy. I remembered the excitement of that and wondering if I’d cope with new subjects like Science, French, Latin, Algebra and Geometry. And I also remember wondering who my new friends would be. Oh yes! The ‘aleerie’ involved lifting your leg in a particular way and bouncing a ball under it. I remember my mother teaching me it. She had learned it in an Edinburgh playground in the 1920s. We used to say ‘Ten aleerie postman’, but I suppose there are regional differences. Continuing with the exhibition, we tut-tutted appropriately at the gender specific toys (a ‘set of tools just like Dad’s’ and a ‘twin tub just like Mum’s’) and cooed over skipping ropes. So much to enjoy, and not a computer in sight. The largest classroom was devoted to Domestic Science, clearly more important for girls then than French, Latin, Algebra and Geometry. 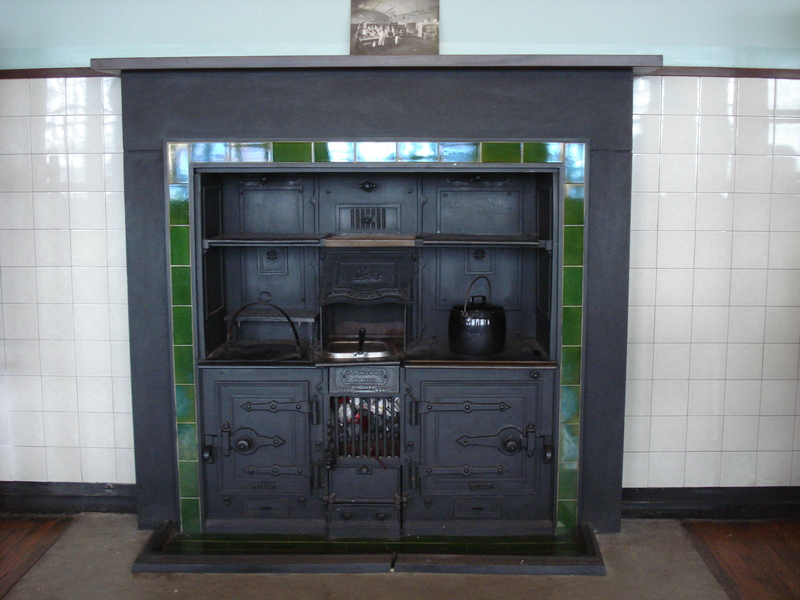 It has a huge polished range, capacious Belfast sinks and a mangle for washdays. 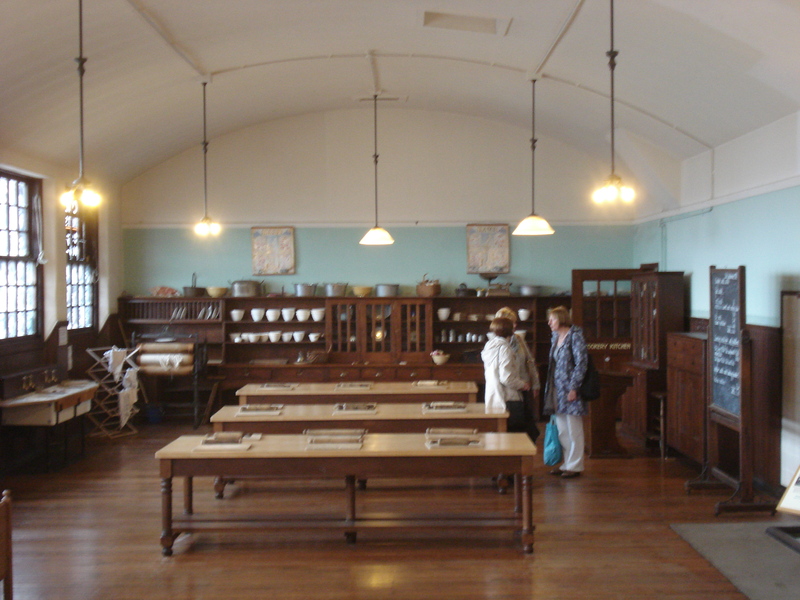 There are three large benches with rolling pins and baking boards at the ready. 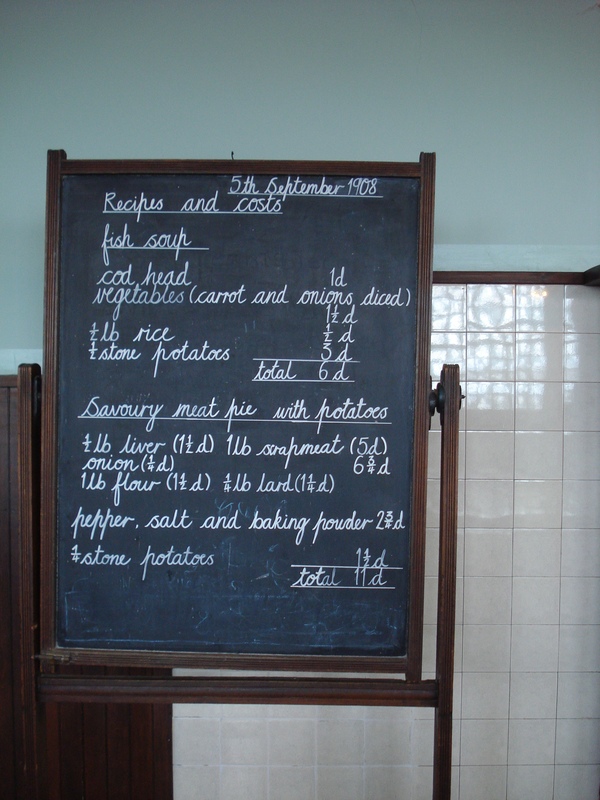 We lingered over the blackboard with the recipe but were not tempted by the fish soup or the savoury meat pie. John walks into a stable and finds 2 horses, 3 cats, 1 dog and a beetle. How many legs are there in the stable? It’s one to keep and solve later. We’re too busy with a photo shoot. How many legs are there in the classroom? Back to School – we love it! And for all those going back this September – enjoy it! The good thing about setting off on a walk is that sometimes there are surprises in store. When I was a child we did a lot of ‘exploring’, and I see going for walks as the grown up version of that. Yesterday was a perfect day for getting out, so we headed up The Helm at Oxenholme which, for very little effort, gives views of Lakeland, the Howgills, Morecambe Bay and the hills of Lancashire and Yorkshire. Our walk continued over fields in the direction of the village of Old Hutton and, judging by the nettle-covered stiles, was very little frequented. The nettles took me back again to childhood explorations and frantic searches for dock leaves as the magic antidote to nettle stings. We did not survive the many stile crossings unscathed. The surprise came at Old Hutton, when an elderly gentleman working in his garden invited us in for tea and cake. ‘I don’t see many on that path these days,’ he remarked. We admitted to a tiny bit of hesitation, particularly when he shouted to his wife that he’d ‘found two’, but we made bold to enter. 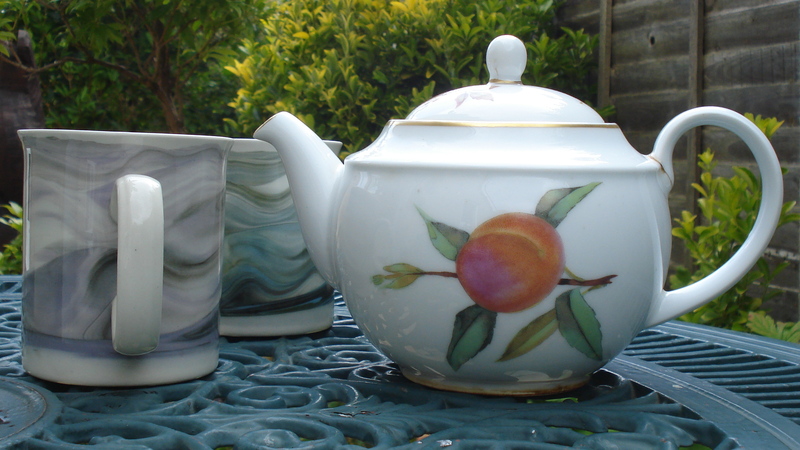 And then, as a reward for our finding of the hidden way, his wife brought out tea and home-made cakes. Over the next half hour we chatted and found many things in common. Things like this don’t often happen, do they? We left so enriched by the experience that I didn’t notice my nettle stings on the way back to the car. Thank you to our hosts for their trust. Thanks to Ink Pantry Publishing for their ‘Sunday Spotlight’ interview on 4th August 2014. My thoughts on writing and a few other things!